ACCRA – In an effort to raise funds for social development and to reduce the country’s reliance on foreign aid, the government of Ghana has introduced a small hike to sales tax. Late last week the parliament of Ghana voted on and approved a hike of 2.5 percent to the national value added tax, from the current rate of 12.5 percent to 15 percent. The Deputy Finance Minister of Ghanna Cassiel Ato Forson said that even such a small increment in the tax rate could raise as much as GHS 745 million over the course of the 2014 fiscal year. The extra funds raised through the hiked tax rate will be used specifically to finance new social infrastructure developments, such as new schools, roading, and healthcare facilities. 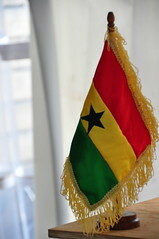 According to the Finance Minister, the rise will also help Ghana reduce its reliance on international aid, and will assist the country in forming a sustainable tax system. The proposal to raise the tax was met with immediate and strong opposition in Parliament, with claims that the tax has not been discussed enough, and suggestions that not enough consideration has yet been given to the potential negative economic effects of the increase. In an effort to show their opposition to the increase, the opposition parties in Parliament staged a walk out from any discussion on the matter, however, enough members of parliament remained to pass the measure regardless.